Blue Marine Resort and Spa is a 5-star hotel in Ammoudara, Agios Nikolaos, Greece. It consists of 202 rooms fully equipped and tastefully designed in order to offer a comfortable, lavish and pleasant stay. The luxury hotel overlooks the blue Cretan beach and this particular aspect makes the hotel an ideal destination for vacationers looking for an exquisite holiday. The luxury hotel also has its own private beach. The hotel houses two outdoor pools and one indoor pool with hot tub. The luxury hotel is known for its spa and wellness centre. Most of the rooms have a sea view the bay of Mirabello. The hotel has multiple restaurants and bars on the premises and an all-inclusive policy in place. The Blue Marine Resort and Spa is located 62.7km and 67.1km away from the Sitia Public Airport and Heraklion International Airport respectively. Apart from that, the Agios Nikolaos Port is 5.4km away from the hotel. The closest beach, Mirabello bay, is 9.6km away. Also, major tourist attractions like Anagia Kera Church and Archaeological Museum of Agios Nikolaos is 10.1km away and 6km away respectively. The hotel can arrange transport for all the local excursions at an additional charge. The Blue Marine Resort and Spa has four types rooms based on amenities, number of guests and the view. 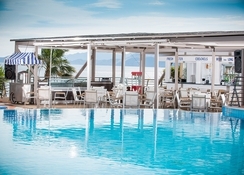 The hotel offers Double Sea View, Family with Sea View, Double Mountain View, Junior Suite Sea View with Outdoor Jacuzzi. The rooms are sized from 290sqft to 538sqft. All the rooms are equipped with individually controlled air – conditioning, satellite TV, DVD –player, direct dial phone, free Wi-Fi internet access, mini fridge, hairdryer, safety deposit box, telephone extension in bathroom, slippers, bathrobes, coffee and tea making facilities, bottles of water, among others. The Marine Resort and Spa houses 4 restaurants and 5 bars. Blue Aegean is the buffet restaurant, Olive Tree offers Mediterranean cuisine, Marino Al Mare Italian restaurant offers Italian food and the Ya Mas Traditional Grill House offers grilled food. The guests can get the all-inclusive package while making the bookings. The bars on the property include Panorama Main Bar, Pelagos Pool Bar, Orange Beach Bar, Theater Bar and the D+D Disco Bar. The hotel offers buffet breakfast, lunch and dinner to the guests. The Blue Marine Resort and Spa has a specialised animation team that presents fascinating entertainment programs throughout the day for adults and kids. Theme nights organized in the hotel theatre. Apart from that, guests can indulge in water sports at the hotel’s private beach. At the hotel, the guests can enjoy tennis, football, basketball, table tennis, card games, French bowls and darts. The hotel also houses gyms, a Yoga centre, water gym, among others. 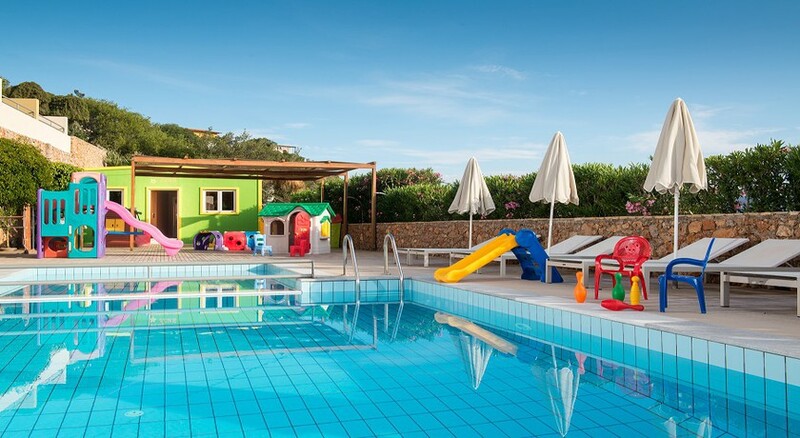 The hotel also has daily evening shows, Greek nights with live orchestra and professional dancers, kid’s playground, mini club, an amphitheatre, dance shows, comedy shows and pool party. The hotel can also arrange for off-site activities like horse riding, diving, cycling, hiking, canoeing, windsurfing, fishing, etc. at an additional charge. The private beach allows the guests to indulge in sunbathing. Lovely hotel with great staff. Food brilliant and some nice entertainment. Will be rebooking. Credit to all involved.